Social business is just getting started. But its value is clearly emerging for innovation, operations, leadership and marketing. So what are companies really doing? In 2012 MIT Sloane Management conducted a survey to really investigate that question. Below you will find my highlights and takeaways from this study. Even though social technologies have been around for some years now. The sentiment from the report is that many companies are still holding back on the adoption of social tools. Of those surveyed, 52% said that it was important or somewhat important to them today. Whilst 86% believe that it will be important or somewhat important in three years. Social business is primarily viewed as a tool for external facing activities with marketing departments, sales and customer services being the main driving force with customer relationship management being at the forefront. The second important use of social software was to drive innovation and competitive differentiation. So whilst the majority see the importance over the coming years most are viewing social tools as external activity, with a smaller group understanding its potential for internal innovation and collaboration. The report highlights the biggest barrier is leadership vision. However it is noted that CEOs are twice as likely to drive strategic adoption of social tools than the CIO and CFO. Lack of understanding on how to measure the effectiveness of social tools is also cited as an inhibitor of adoption with many not measuring at all. Social business depends on leadership, metrics may not be critical when experimenting with social software, but as it becomes more important to organisations, having metrics in place can help managers assess, encourage and reward related behaviours. Helping shift their cultures to be more compatible with social business. CEOs recognise that leadership can be improved with social business, may be more than other members of the C-Suite. The report asked “Why do you use social business at work?” The top three answers being : To network, effectiveness and to voice opinions. Motivations to participate in social business activities are thus far from superficial and even go beyond just our social nature. They can help fulfil basic psychological needs. The report also noted that larger organisations and smaller organisations appreciate the value of social business more than that of mid size organisations. With the smaller companies saying they could increase their voice and connect with customers to really make themselves seem bigger than they really are. A clear vision of how social media supports the business strategy was top facilitator in the report. So the first step in your social business journey is to create and communicate the broader social strategy for your organisation. 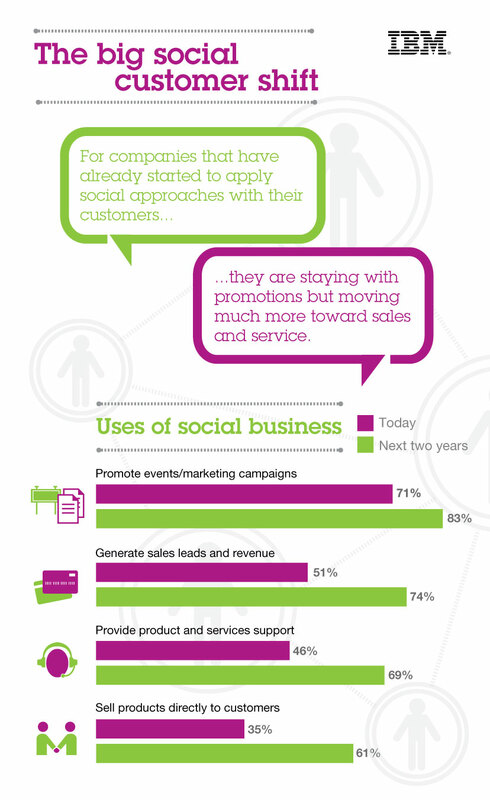 What business challenges are to be solved with social business activities? What is the Strategy to make this happen? What technology best supports these objectives? What kinds of social networks will support this strategy? Most important is to realise that your social business journey will take time, require and drive changes to your business processes. Defining organisational structure an how you interact with customers and employees. Take the time to access where you are today, identify problems that are currently being addressed with social tools. Consider if the correct resources are being directed towards the right problems. If you are heavily regulated make sure you have governance process in place to address these. Identify the people or roles that will focus on social business and how these individuals will coordinate with each other. Use listening tools to collect information about your brand, customer service and competition. This area hols tremendous potential for organisations. Ensuring that your business has enough resources is fundamental. Have you chosen to assign the tasks to an individual or will it be on top of someone’s day job. Will you have incentives in place, targeting and rewarding the correct people. Have you resources in place for communication, content creation, community management and training. Whilst the report makes it clear that many companies are not measuring and whilst in experimentation mode this may not be so important. Measurement will however need to be conducted especially when redefining practices and processes, measuring adoption thought will be misleading so not advised. For people, often what matters most is whether the tools helps them to do their jobs more effectively. Given that social business is just getting started you may be tempted to wait. But that approach may delay achieving its potential in your organisation, to the detriment of your innovation, leadership, operations and marketing. Proof of concept, pilot, or evaluation, call it what you may, but most organizations nowadays are sticking their toe in the water before “going social”. For many, it’s a big move. Transforming isolated data silos into a consolidated social platform that delivers outstanding collaboration and creativity benefits yet also challenges traditional reporting hierarchies may intimidate some. So, running a pilot is judicious. Like most software implementations, social software is often piloted in a proof of concept before roll-out. This gives management and users confidence in the outcome as a viable solution, allows time for user acceptance testing and prevents any “issues” being rolled out to a broader audience. The solution can be fine-tuned post pilot and rolled out. Because social software is new, unique challenges apply and flexibility is essential. Experience is sage in this new era of social business; learning from the mistakes and successes of early adopters will enhance your chances of success. Here are some points of consideration, learned from the real, world which may help you with your pilot. 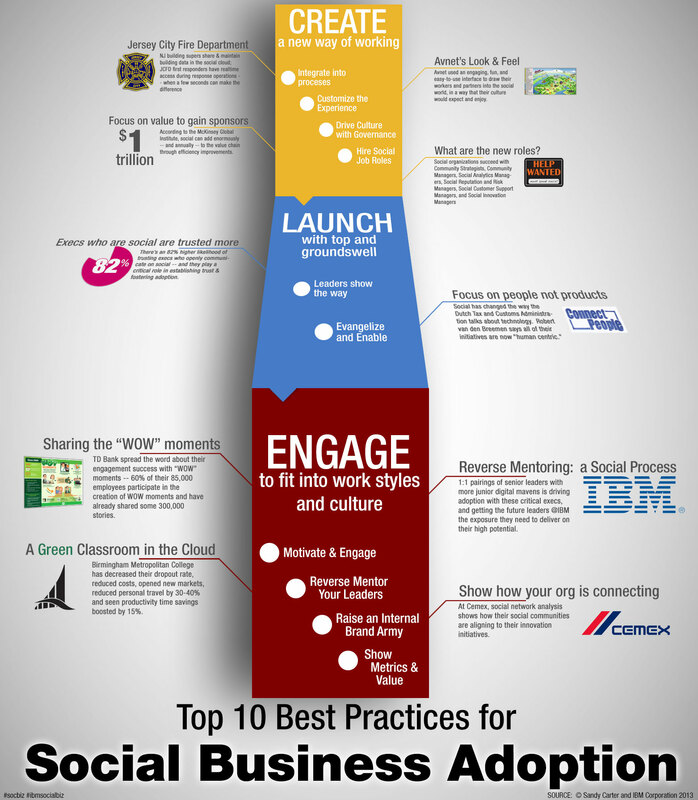 via 10 Tips for Navigating Your Org with IBM Connections – IBM Social Business Insights Blog. Some individuals are more open than others; a salesperson, for example, may choose not to share information because they see it as their intellectual property, their asset. A subject matter expert may be reluctant to share their knowledge because if they do so they feel less indispensable. The introduction of social software offers a unique opportunity to challenge “closed” environments and the potential to deliver fantastic bottom line benefits through the sharing of knowledge. Try to create a culture of sharing rather than hiding. There’s plenty of research and comment around topics such as finding new customers, customer satisfaction, collaboration, building value, individual benefits from embracing Social technologies… This report demonstrates that IBM is ahead of the curve for adoption (own use) and for solutions for firms embracing (for their use). The speed and scale of adoption of social technologies by consumers has exceeded that of previous technologies. – Several distinct properties of social technologies make them uniquely powerful enablers of value creation. The most fundamental is to endow social interactions with the speed, scale, and economics of the Internet. – Based on in-depth analysis of usage in sectors that represent almost 20 percent of global industry sales, we identify ten ways in which social technologies can create value across the value chain. – Companies that rely heavily on consumer insights for product development and marketing purposes have an opportunity to create value by engaging with consumers on social media and monitoring social media conversations to generate consumer insights and market intelligence. – Individuals and the communities they form will derive much of the benefits of social technologies. – Giving social interactions Internet scale, speed, and economics carries risks. These risks include identity theft, loss of intellectual property, violations of privacy, abuse, and damage to reputations. Social technologies also can disrupt traditional business models. – The benefits of social technologies will likely outweigh the risks for most companies. 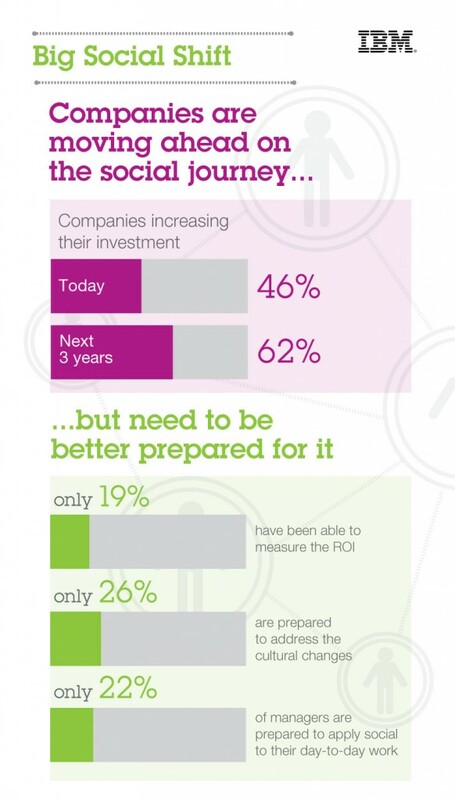 Mgi the social economy full report mckinsey from Ben Martin Social_Ben. If you have any questions or want to explore the benefits of being a social business, contact me. 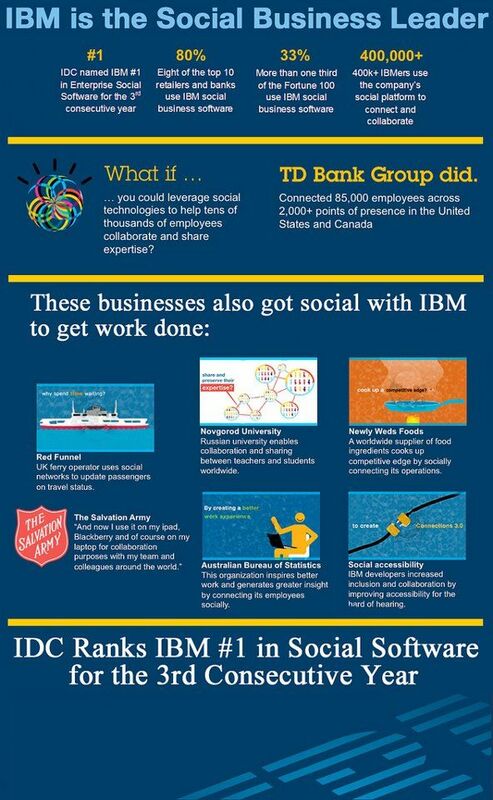 IDC announce the Social Business Leader as…. Are you interested in hearing more? We all love coffee, my treat.